Again, as with many books and with my being a film critic, I heard about the movie before I heard about the book. 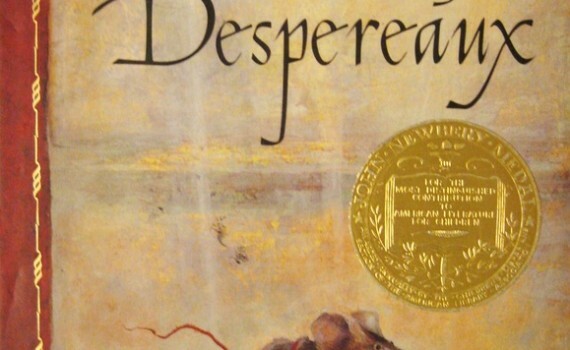 Despereaux the film came out in 2008, while the book came out in 2003 and won a Newbery Medal in 2004. I haven’t actually seen the movie, but it was my first exposure to the story and I was then aware that a children’s fantasy book by the same name was out there somehow. It recently happened to be on display at my local library, so I picked it up. I like to read both children’s & adult classics to my kids while they have snacks; I think it’s a great way to get them interested in novels early, to let them hear the sort of beautiful language that is so often set down for us to enjoy. Despereaux just happens to be one of the most wonderful stories I have ever read to them. It’s a simple tale (I’m sure the pun is intended, though I applaud DiCamillo for not altering the spelling) about a lowly creature aspiring to be so much more. Actually, it’s about three lowly creatures aspiring to be more, and the way in which their lives intersect on their respective journeys to achieve that goal. Despereaux Tilling is a castle mouse, a tiny & very odd little guy who dreams of knights, bravery, princesses, and happy ever afters. Roscuro the rat is nothing more than dungeon vermin, but he longs to see the light of the world above, to shed his detestable skin and become something new. And Miggery Sow, a girl named after a pig, a girl no one loves, a girl no one cares for, a girl who hopes beyond hope to someday become a princess. These three characters will meet at a desperate time, with all their fates hanging in the balance, with bright futures glimmering on the horizon. The book is an oddity in the way it tells the story, giving the first 3/4 to character development & background, setting the groundwork for the tale, but not actually presenting any direct action until toward the very end. We meet Despereaux, learn about his differences, meet Roscuro, understand his dark desires, meet Mig, begin to feel sorry for her plight, and then the book is almost over and the climax hasn’t even begun. So the story becomes about the players, not the play, and I wouldn’t have wanted it any other way. It was delightfully written, perfectly clever, amazingly simple & beautiful; I wouldn’t have cared if not a single exciting event took place. But at the same time, my children loved it because the story was clean, easy to understand, intelligently worded, and fun enough to keep their attention. It takes true talent to craft a novel that children will get behind and adults will enjoy reading; The Tale of Despereaux is a perfect display of this art form, Kate DiCamillo being the artist, and we as readers being lucky to have stumbled across something so fantastic.